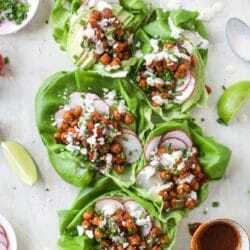 Chickpea lettuce wraps to the rescue! These are everything I want in lunch: crunchy, crispy, tangy, flavorful and ridiculously satisfying. Like, super filling! I love love love them. Oh and pretty easy too. I need something easy since I spend the majority of any break I take for lunch losing my brain in the internet vortex, mostly over memes of things like Mall Madness circa 1993. What a great freaking game. First, crunchy chickpeas! I mean I talk about them all the time and they are just theeee best snack. And yes, I know there are a ton of packaged options out there now (which didn’t exist when I first started making these!) but they are so easy to make at home, I never find a reason to grab those. Unless I’m, like, in an airport or dying of hunger and need a quick not-terrible-for-me snack! Doing it at home is just so simple though. The flavors on the chickpeas are so customizable! Which is excellent for someone like me who gets bored all the time. And the texture is the best, especially when you’re in need of something with crunch. I like to toss the chickpeas in a very light coating of BBQ sauce right before adding them to the wrap (because they maintain their crunch that way!) and then also layer on some avocado and radish slices. They are extra flavorful this way. Just totally want to eat them with a spoon. Next comes some fresh chives and crumbled feta. Of course. Seriously, what is a life without cheeeeese. Also! On top we have this little BBQ lime crema thing that lends a richness to the wrap. Everything is better with sauce or dip, am I right? One of my other favorite meals to make? These BBQ chicken and pineapple lettuce wraps, which totally inspired these. I wanted to make a quick vegetarian version and here we go! And yes, when I say “quick,” I realize that roasting the chickpeas isn’t exactly super fast. You can roast them ahead of time or you don’t even really HAVE to roast them. If you are kind of “meh” about the whole crunch aspect, just toss them with some BBQ sauce and you’re good to go. Nothing like a fun lunch to make you feel fancy! Preheat the oven to 425 degrees F. Line a baking sheet with foil or parchment paper. Place the chickpeas on a paper towel and pat the as dry as you can. Remove any loose skins. Put the chickpeas on a baking sheet and drizzle with olive oil or the oil of your choice. Sprinkle on the salt, pepper, paprika, garlic powder, and onion powder and toss well to coat. Make sure the chickpeas are in a single layer. Bake for 15 to 20 minutes, toss well and flip, then bake for about 15 to 20 minutes more. I like them super crispy! Remove the chickpeas and lightly toss in 1 to 2 tablespoons of BBQ sauce. Assemble the lettuce wraps by placing a few chickpeas in the center of the lettuce leaves. Add on the slices avocado, chives, feta and radish. Drizzle with the BBQ crema and add a spritz of lime! Whisk together the ingredients until smooth! Store in a sealed container in the fridge for a few days. And then there is always still room for cookies. Oh my days! I think this recipe just saved my dinner, shall defiantly be making this, this evening! I’ve been looking for more vegetarian based meals and this looks beyond delish! Mall Madness was such a great game!! Gosh I thought my best friend and I were the only people playing that game. I’m constantly getting sucked into that vortex during a lunch break too! I’ve been waiting for you to post this recipe!! thanks katy! hope you try it! Oh goodness! I can’t wait to make these! i loved mall madness! that was my favorite game – that and those fashion designer plates where you could color outfits – do you know what i’m talking about? the best. LOVED this recipe! The chickpeas were so crispy and flavorful – next time I’m going to make these for a taco filling tucked into corn tortillas! Thanks for the great recipe! These were fabulous, Jess. Even my 4 1/2-year-old twins ate the chickpeas and dipped radishes in the crema. Consider that a win!